Yet again, The Man and I were being abandoned by the Chick who was off to a party at a friend’s house, so we decided to go out for a meal. 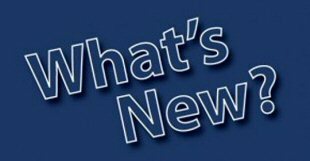 Typically, we couldn’t agree on where to go so we posted on our site for suggestions and, as always, you lovely lot came up with some corking suggestions. We settled on The Bulls Head at Denby and duly headed off; it was a straight forward journey and there is plenty of parking available, so no hassle when you get there. As you go through the door there is a sign pointing right for the Bar, left for the Restaurant so it’s dead easy to navigate to the right area. A lovely lady served us at the bar/reception area, asked if we wanted the drinks putting on our tab, and then escorted us to the upstairs seating area. I was surprised at just how many tables there are overall when you combine the lower and upper parts; both areas have a nice “privacy” space between them and the tables are good, sturdy affairs. 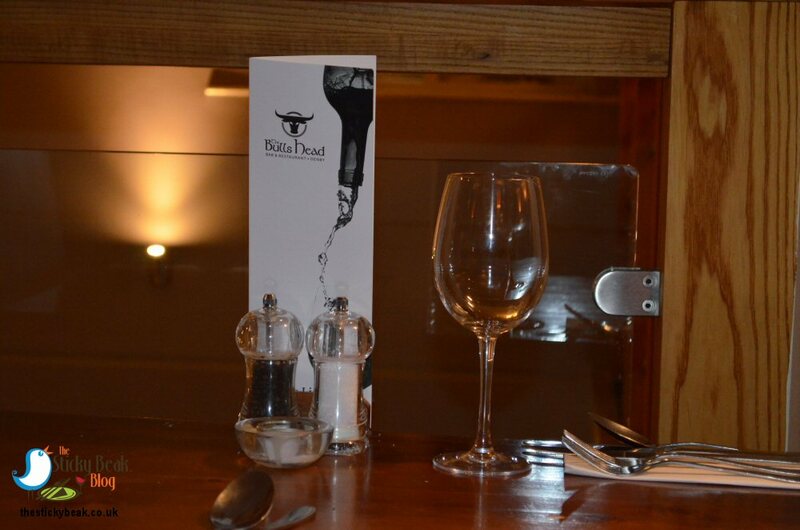 The Bulls Head has a lovely traditional feel to it and a friendly atmosphere; the staff were all very personable which helps enormously with this. 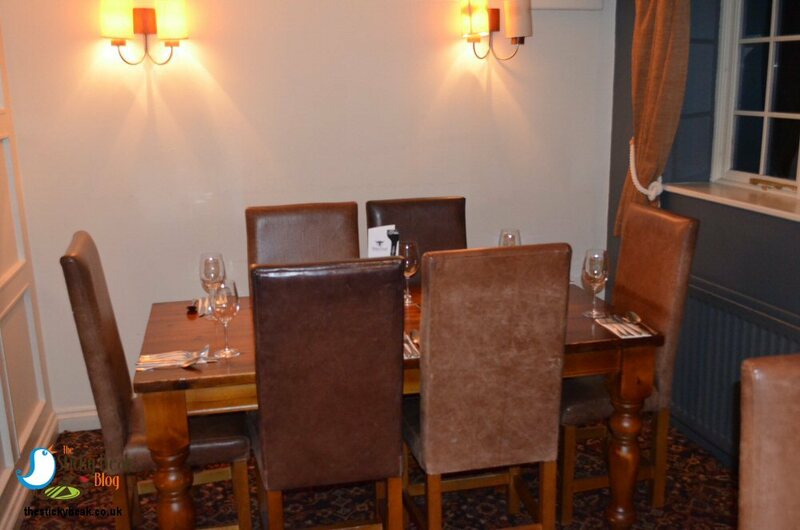 When we arrived there were already family groups in, with children of all ages, so you can definitely be assured that it is a child friendly pub restaurant. We settled in at our table and relaxed on the very comfy high back chairs as we perused the every day and specials menus, trying to decide on what to have. 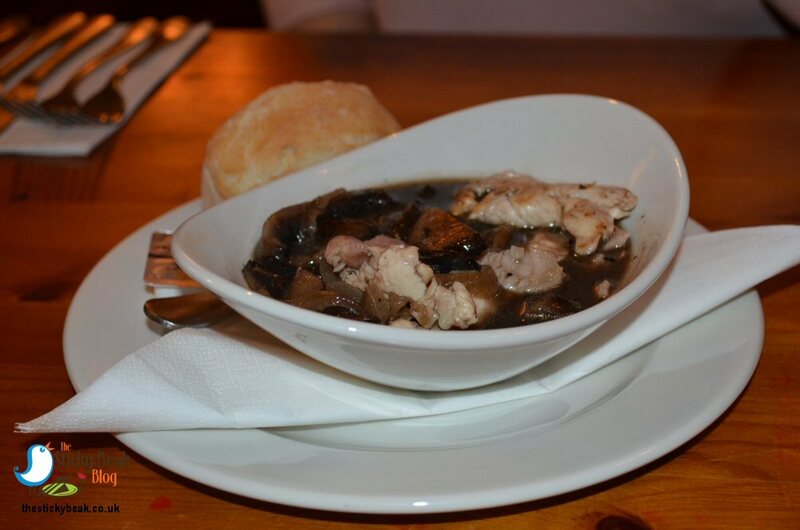 For starters we both chose something from the specials menu; Coq au Vin served with a warm mini loaf for me and the Stuffed Pepper for His Nibs. The Man Bird was savouring his stuffed pepper with its spiced mince and onion filling, the happiness on his face was plain for all to see. This was presented with mixed leaf salad garnish which, along with the good sized yellow pepper gave the dish a great pop of colour on the plate. 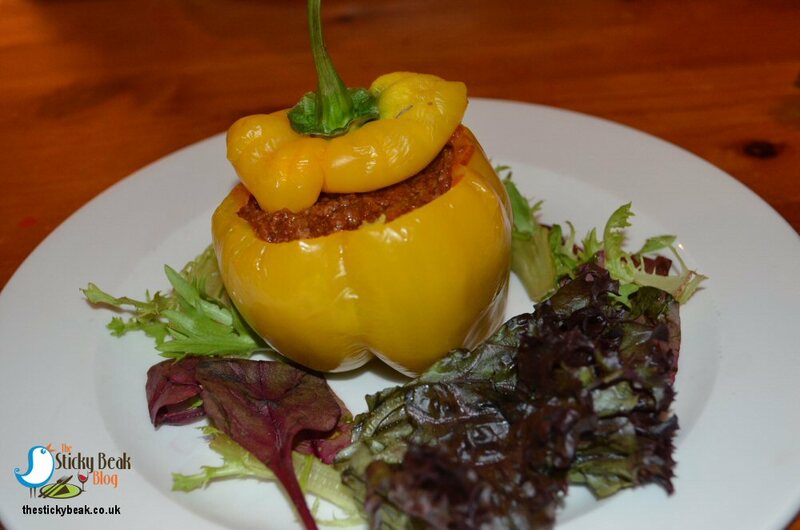 The pepper itself was firm enough to hold the contents, but was soft enough to make it pleasant to eat and the spiced mince certainly packed a punch, so he had a real belly warming starter too. For our mains I had a dish from the regular menu, Woodland Chicken, and The Boy Wonder had a choice form the specials menu, Steak Melt. 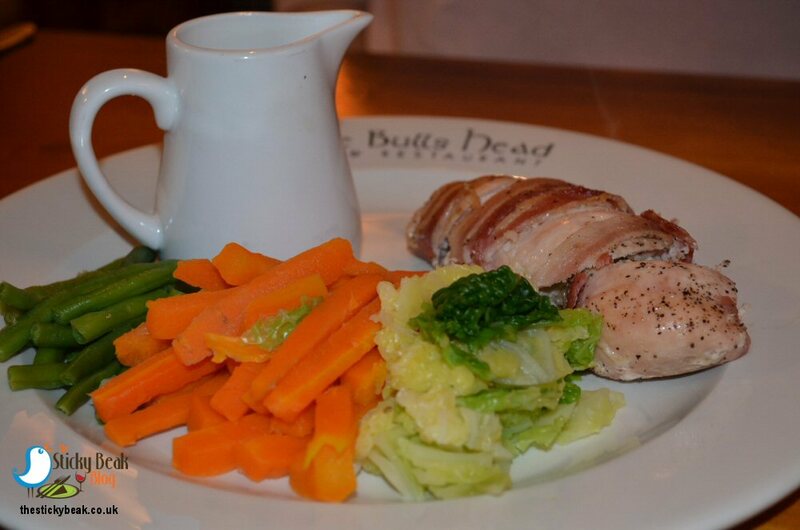 My Woodland Chicken is a chicken fillet stuffed with Spinach and Brie, wrapped in bacon and served with chips, salad leaves and a Mustard and Cheese sauce. I didn’t fancy chips, so the staff very obligingly swapped this for seasonal vegetables for me. The chicken fillet was a formidable beastie, but cooked very well to retain its moistness and flavour and there was a nice amount of Spinach and cheese filling in the middle too. Good, thick slices of Bacon were wound round the outside of it and these had a great flavour so that all the tastes combined in harmony to produce a delicious dish that I thoroughly enjoyed. The vegetables (Carrot batons, Savoy cabbage and Green Beans) had all been cooked nicely too so that you got a hint of their natural texture and all of the flavour. A beautiful, crisp, colourful salad bowl was the final component of my meal and again it was delicious. 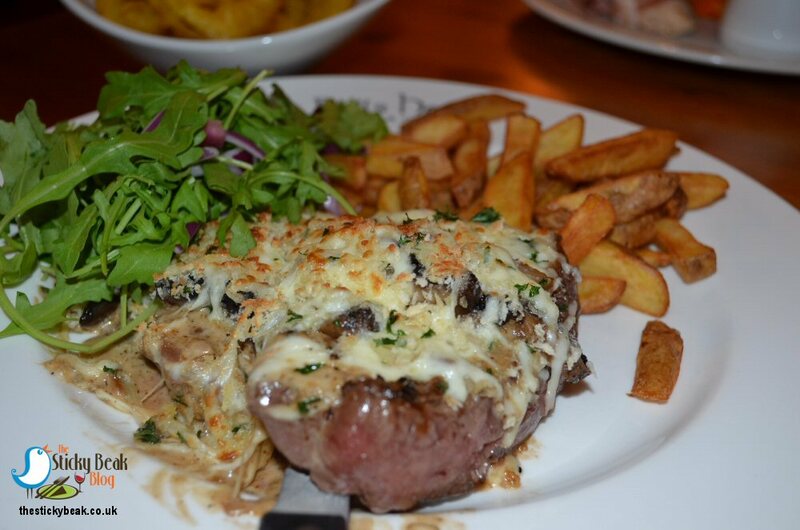 His Nibs was cutting into a thick 8oz slab of Rump steak that was topped with sliced Mushroom and creamy peppercorn sauce, then coated in bread crumbs and melted Mozzarella cheese. 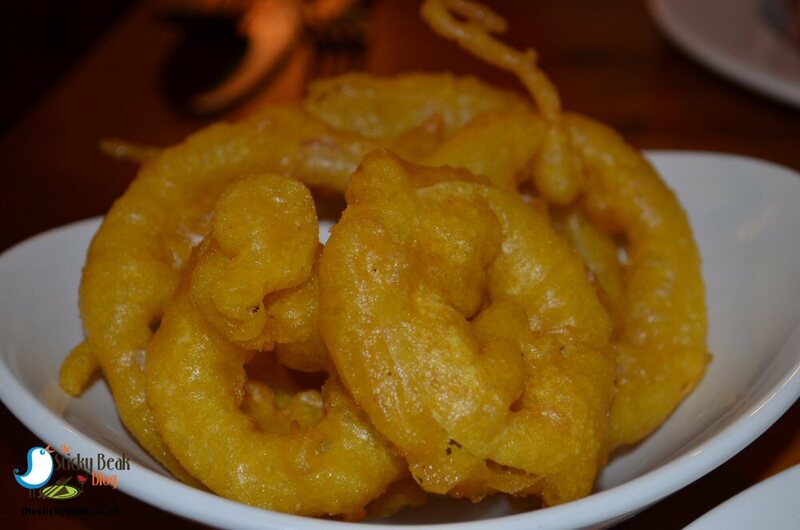 This came with homemade, skin on chips which had a fab taste to them and he had also ordered a side of Onion rings. These little beauts were good thick slices of (still just firm) onion coated in a light batter and fried until they were nice and crispy. Nothing went begging on his plate, except for the edge of the rump which the staff kindly vac-packed for us to take home to our pampered pooch. I have to say that the dessert selection is one of the most extensive I’ve seen in a pub restaurant for a long while and it took us both a fair old while to whittle down to our final choices. 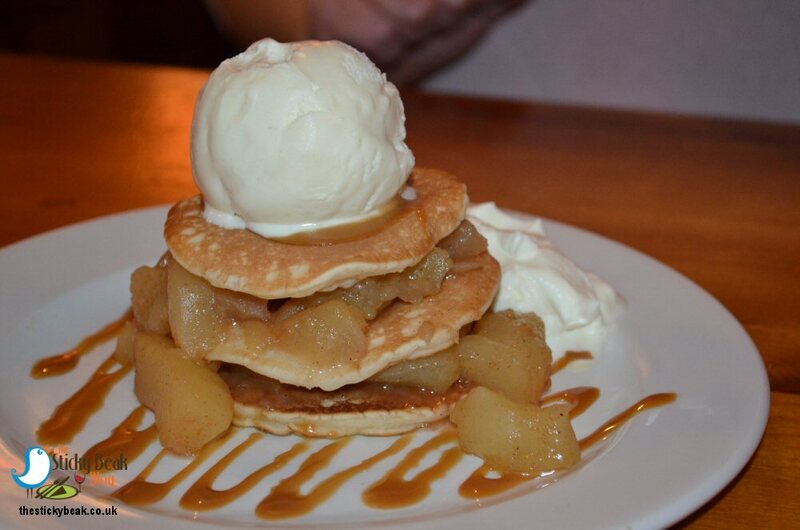 Eventually I plumped for the Toffee Apple Pancakes served with Cream and Ice cream, then drizzled with toffee sauce and Him Indoors had the Toffee crunch Blondie which he chose to have with the Ice Cream, although you can have whipped cream if you prefer. The Pancakes are layered with sweet, softened Cinnamon spiced Apple to create a very tempting little stack of loveliness that resonates as we approach the festive season; to me Cinnamon is one of the iconic Christmas smells. The pancakes were the kind that you see in packs rather than the type you flip on Shrove Tuesday and were just a nice size to leave you satisfied rather than with that uncomfortable over-stuffed feeling. I have to say that it was a rather moreish pudding and I savoured every last little bit (bar licking the plate!). 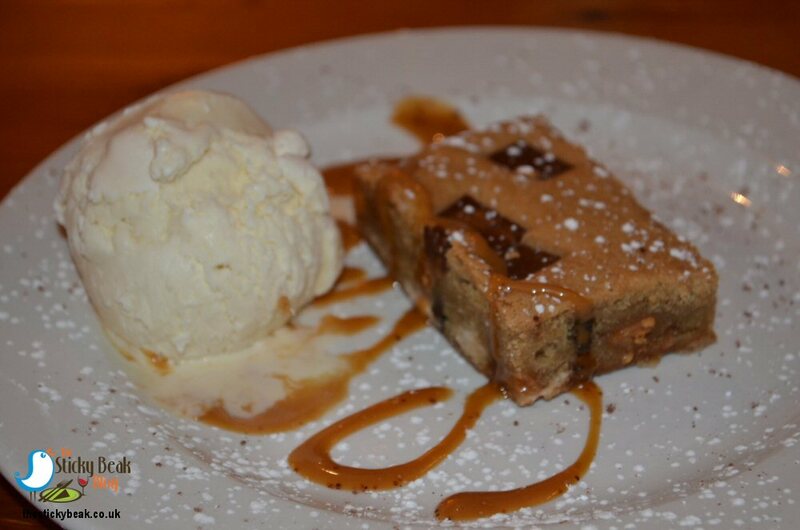 In the words of the Man Bird, the Toffee crunch Blondie was “warm, rich and gooey; dessert heaven”. The Blondie had white and dark chocolate chunks, as well as chewy toffee in it, which were all slightly melted to really enhance their yumminess. A good quality Ice Cream can make or break a dessert, and the one at The Bulls Head is jolly good in His Nibs’ opinion. As usual we rounded things off with a couple of coffees, although I was rather naughty and had a Bailey’s Irish Cream one, whilst The Man had a plain Latte. The evening was superb, both in terms of quality and choice of food and customer care given by the staff. If you haven’t been before, I can strongly recommend it to you.